Mohs micrographic surgery has been proven to be the most effective technique for removing basal cell and squamous cell carcinomas (the two most common types of skin cancer) as well as some melanomas and other more unusual skin cancers. This technique was developed by Dr. Frederick Mohs in the 1930s. The technique used in Mohs surgery results in the highest cure rate, as well as the best cosmetic result because it spares healthy tissue more than traditional methods. The technique is a systematic approach of removing the skin cancer and examining the tissue samples immediately. The samples are cut in a unique method with detailed mapping to examine the margins. Only the margins that are not clear need further excision, thus preserving as much healthy tissue as possible. Mohs micrographic surgery results in a near perfect cure rate, which is superior to other approaches and spares healthy tissue resulting in better cosmetic results. * This technique is especially useful on areas of the skin that benefit from tissue sparing, head and neck, genital areas, hands and feet and on lesions that have reoccurred. 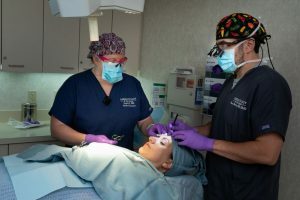 * In addition, Mohs is done under local anesthesia in the comfort of the office as opposed to having to undergo general anesthesia in a hospital. 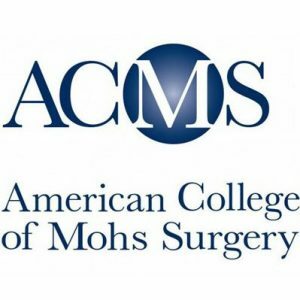 It’s important to choose a fellowship trained Mohs surgeon who is a member of the American College of Mohs Surgery, like Dr. Mendese. Mohs College surgeons have undergone at least 1 year of fellowship training beyond dermatology residency, which allows for additional experience in all of these specialized processes and techniques. I don’t see anything after my biopsy; do I really need to be treated? Although Mohs surgery can take longer than other techniques to perform, advances in technology, such as automated staining of tissue samples, have made it quicker. While it is impossible to predict exactly what timeframe to expect for each Mohs surgery procedure, the entire procedure usually lasts 1-2 hours. Rarely, clearing the tumor and reconstructing the defect can take the better part of a day. A consultation with the Mohs surgeon prior to your procedure will allow for the surgeon to understand the unique qualities of your situation and enable him/her to more clearly estimate the extent of the timeframe for the surgery. 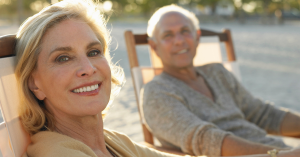 Yes, as will any treatment for skin cancer, Mohs surgery will leave a scar. But we work to hide it. The vast majority of patients don’t need anything more than a suture removal appointment. Some don’t even require that. However, if needed, at Dermatology and Skin Health, we offer a variety of laser treatments that can address redness or textural irregularities post-surgery. These are performed without a charge to the patient. We want you to have the best outcome possible and will see you as often as necessary to make the patient (and us!) happy.